The Skills Funding Agency (SFA) will reduce funding rates for the level three ‘IT, Software Web and Telecom Professionals’ apprenticeship framework by around £2,000 from April 1. The agency warned in it’s Update bulletin this afternoon that it would be reducing the funding values for the Level 3 competence qualification. The rate for the competence qualification published by the SFA will fall from £8,673 to £6,650, a 23 per cent reduction. For a fully-funded 16-18 year-old learner, this would equate to a fall from £9,299 to £7,131, a cut of £2,169. The Update bulletin said that “this is part of our regular review of apprenticeship framework costs to ensure value for public funds. The SFA has not reduced apprenticeship framework rates since 2012/13, after a freeze was imposed during plans for switching to the new standards funding system. But FE Week understands the rate for ‘IT, Software Web and Telecom Professionals’, which is one of the highest for all frameworks and includes a competency, knowledge and up to three functional skills qualifications, is now considered far too high by the SFA — particularly at level three. Funding for a 16-18 year-old learner that completes at level 3, for example, currently exceeds £15,000 and can rise to over £18,000 if delivered in central London. “Based upon the most up to date information, the new rate is more reflective of the cost for delivering the framework, an SFA spokesperson told FE Week this morning: “We are making the change following a review, which we do periodically and when new information is available, as part of a routine review of apprenticeship framework costs. But Stewart Segal, chief executive of the Association of Employment and Learning Providers, told FE Week he would be calling on the SFA to review the timing of its decision. He said this “very short notice” change had not been thought through and would “inevitably disrupt starts for learners and employers”. 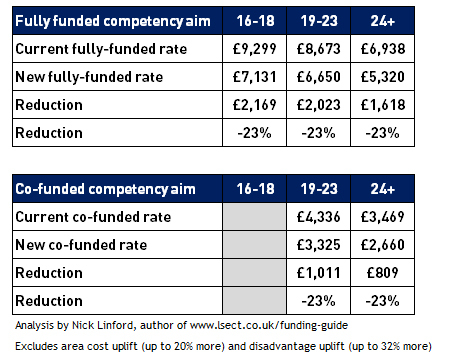 Despite the relatively high level of per apprentice funding, the level three course is, for example, not a relatively long framework. The Tech Partnership, a network of mainly large technology firms, is the government’s Issuing Authority for the apprenticeship framework and they expect a minimum of 18 months with just a minimum of 674 guided learning hours with Functional Skills or 539 without — or, they say, as little as six months for an adult with prior attainment. The framework is becoming increasingly popular with colleges and training providers, especially those recruiting fully funded 16 to 18-year-old learners. It had the second most starts at level three for 16 to 18-year-olds by framework last year and the number of starts have been rising rapidly since 2012/13. There were 38 providers delivering this framework, also based the latest success rate data — with the most in total being the British Army (870 leavers) and QA Limited (450 leavers). The Tech Partnership was unable to comment ahead of publication. Here we go again, another poorly thought out decision imposed on the sector halfway through a Funding Year. This is meant to be a key industrial sector – how will cutting the funding help grow skills capacity in this area? Perhaps they’ve noticed that this framework is money for old rope? Ah, I seem to recognise a provider in the list that used to deliver the very lucrative trail track apprenticeship to under 19 year-olds in around 6 months before the minimum duration 12 month apprenticeship framework rule was introduced. I wonder why this framework is “becoming increasingly popular …..”? Of course we know why! It is called a nice little earner. Anyone remember the taxi drivers NVQ that was cost weighting factor the same as engineering in the TtG days? Same old story! Thousands spent on this, around £50 million in the year I requested the data from the LSC at the time.